Welcome to the Booking Center for Melanie Anderson. The following information is provided to help with the small details. We look forward to working with you. 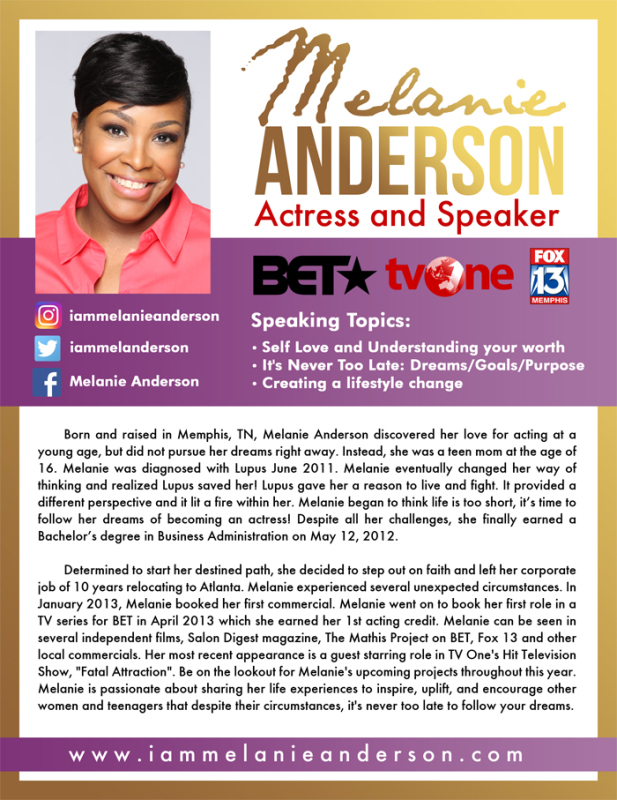 Born and raised in Memphis, TN, Melanie Anderson discovered her love for acting at a young age, but did not pursue her dreams right away. Instead, she was a teen mom at the age of 16. By 19 yrs of age she had 2 children. Melanie was married at the age of 25 and gave birth again at the age of 28. Now with a husband by her side Melanie could finally accomplish one of her goals…she enrolled at Strayer University. In 2008, Melanie lost her grandmother who was the matriarch of the family. By 2009, Melanie found herself divorced, single mom again, trying to raise a troubled teen while being a fulltime employee and now a fulltime student at Lemoyne-Owen College. Melanie was not pleased with the examples she was setting for her children. Melanie began to do a serious self evaluation and soul searching. She decided it was a priority that she work on having more of a personal relationship with God. June 2011 Melanie received some devastating news. She was diagnosed with Lupus. Initially, Melanie thought this was a death sentence, she silently became depressed for months. It was a hard pill to swallow. Once she accepted the diagnosis, a fire lit within Melanie and she begin to think life is too short, it’s time to follow her dreams of becoming an actress! Melanie changed her way of thinking and realized Lupus saved her! Lupus gave her a reason to live and fight. Despite all her challenges, she finally earned a Bachelor’s degree in Business Administration on May 12, 2012. Melanie ultimately decided to focus on her dream of acting. In August 2012, she drove from Memphis to Atlanta every other weekend for acting classes. 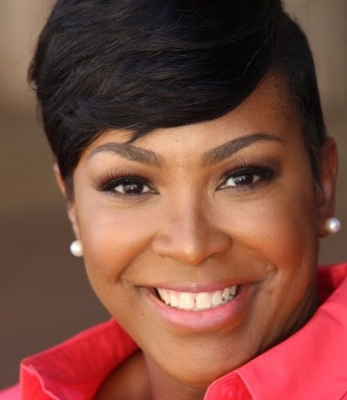 Determined to start her destined path, she decided to step out on faith and left her corporate job of 10 years. Melanie relocated to Atlanta and experienced several unexpected circumstances but she allowed each one to teach and strengthen her. Melanie booked her first commercial in January 2013. She went on to book her first role in a TV series for BET in April 2013 which she earned her 1st acting credit. Melanie credits her training and accomplishments to Jemal McNeil, Tasha Smith, Nick Conti, Terri J Vaughn, David E. Talbert and Greg Alan Williams, who has given her the tools needed to build an acting career. Melanie can be seen in several independent films with a few being placed in film festivals, Salon Digest magazine, The Mathis Project on BET, Fox 13 Memphis and My Global Impact local TV commercials. 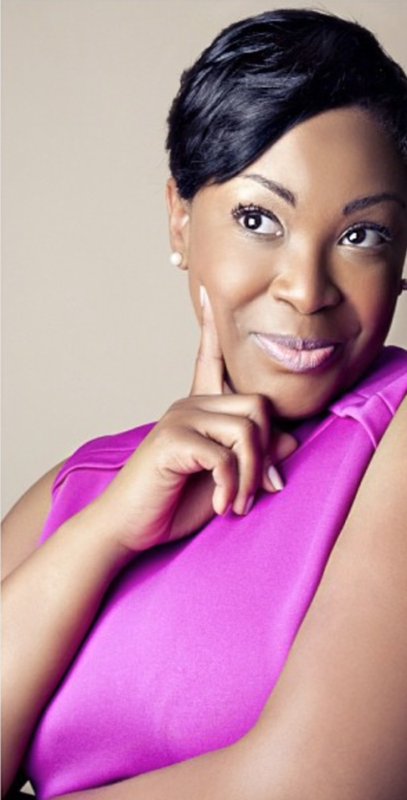 Her most recent appearance is a guest starring role in TV One's Hit Television Show, "Fatal Attraction". Be on the lookout for Melanie's upcoming projects throughout this year. Melanie is passionate about sharing her life experiences to inspire, uplift, and encourage other women, teen moms, and youth/young adults that despite their circumstances, it's never too late to follow your dreams.